by going to find Him in the poor. 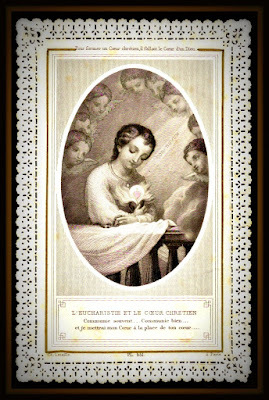 "The Eucharist and the Christian Heart"
What a beautiful, beautiful holy card! Thankyou, Micki! I don't think I've seen that card before... beautiful, of course. It's always a joy to visit you here, Micki. God bless you abundantly! Love you! Easter - So good to "hear" from you again. You bring a smile to my face. Hope the family is well and you are enjoying your beautiful Hawaiian weather. It is nice to see something from Blessed Pier. My son's name is Piers and this was the closest his first communion teacher could come. He is a fine saint-to-be, but my son is actually named for St. Peter himself. Piers is a Norman version of Peter (related to the French "Pierre") which is still used in Ireland. However, more boys should have Blessed Pier as a beautiful namesake and example. Cathomom5 - Hope you get your problem solved regarding your password........Thank you so much for letting me have the opportunity to learn. How interesting about the name Piers. We belong to St. Peter's Church and now I will be reminde of Blessed Piers also. Appreciate your sharing that. Please forgive me for asking this, but I am helping an older friend of mine who has taught a very traditional First Communion preparation class for many years. She would like to put together a book to "pass on" what she does, but most of her materials are so old and have been photocopied so many times that they are unusable. I am trying to reconstruct them as best I can. I would love to be able to use an image like this one--which so perfectly encapsulates the sentiment she tries to instill in the children--if you would consider sharing a higher resolution image with me. I can be contacted at Lbergman2 (at) sbcglobal (dot) net. I know this is a lot to ask, so I will understand if you decline. Thank you for considering it and God Bless your day. Lisa - Thank you for your kind words. I will email you the file. Let me know if I can help in any other way.